Visiting the West of Ireland ? On a budget? You CAN do it! It’s a fabulous morning here in Galway, which is in the West of Ireland! The sun is shining, blue skies, hopefully this is the beginning of a lovely summer…. There has been a lot of talk of Ireland being expensive, so I thought it would be a good idea to give you an example of how you can stay in a hotel at budget rates, so you can enjoy the sights, food, people, music and much more.. I live very near a market down called Gort , and every day I drive through Gort, I see this sign! 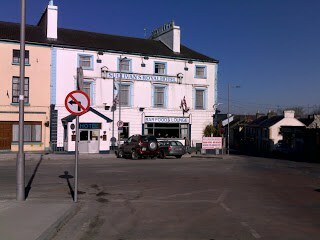 Sullivans Hotel is situated in the centre of Gort, overlooking the square, adjacent to the bus stop, post office. 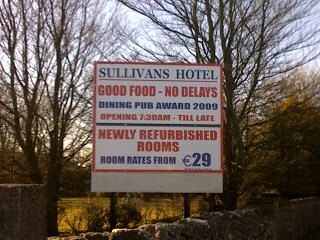 Sullivans Hotel is known for its award winning Food, and all rooms have got tea/coffee making facilities, Power Shower, Very comfortable and Clean rooms, and it’s family ran.Cots available for children/babies and most importantly it is ideally located between Galway and Ennis, so you can use it as a base to visit the likes of the Burren, Ennis, Coole Park, Kinvara, Loughrea, Kiltartan Museum. Thoor Ballylee and much more. Once the railway is re opened, you’ll be able to get the train from Gort to get just about anywhere in Ireland.. So I had a chat with the owner to find out exactly what the conditions are , so here you go.. If you are staying on other days in a Double Room( ie 2 people), the room rate is 75 Euros, and includes a Full Irish Breakfast( so that’s 37.5 Euro per person).